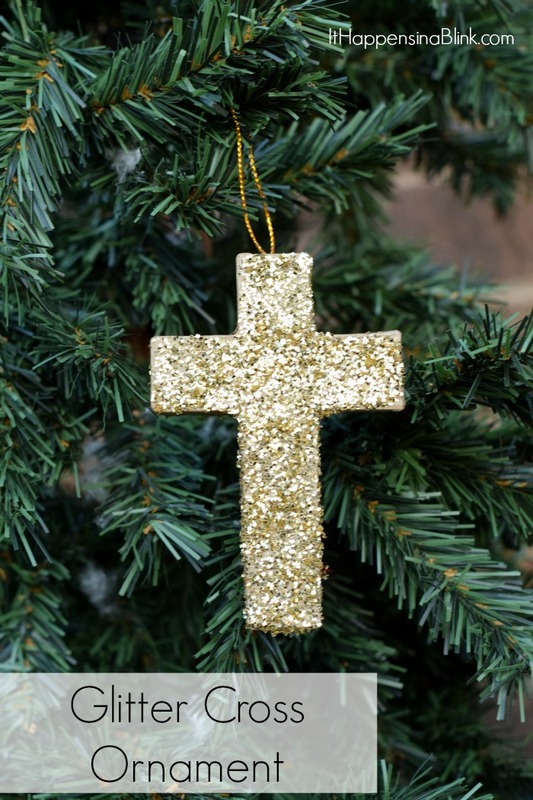 A few weeks ago, I was inspired to create an awesome series– an entire month of faith based Christmas ornament tutorials. I pulled out my notebook and scratched down over twenty ideas of Christmas ornament ideas with a faith based theme. I zoomed to my local crafts store, purchased a few supplies, and then raced home to get crafty. Then life happened. My husband went out of town. My kids went on a Halloween sugar high for days. Add in laundry, homework, and housework, and I haven’t gotten much accomplished. Well, I guess that’s not entirely true. The kids are happy and safe, so that’s definitely an accomplishment. But I haven’t gotten nearly as far as I would have liked with my series. While there will not be a whole month, I have several in the making and a few completed. 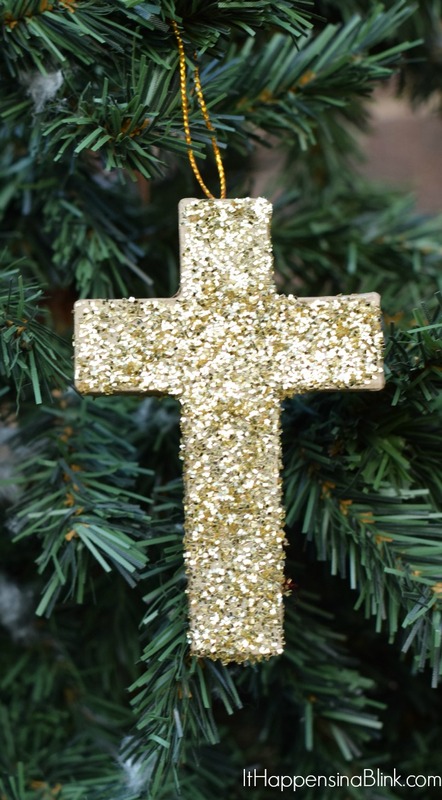 Stay tuned for them throughout the month to get ideas on how you can add a little faith to your Christmas tree! First, let’s talk supplies. I thought all craft stores would have the same stuff this time of year, but they don’t! The only places that I have been able to find the Paper Mache Cross Christmas ornament have been AC Moore and Hobby Lobby. I did not find them at Michaels. I could also not find any on Amazon. This craft is simple once you’ve assembled all of your supplies. 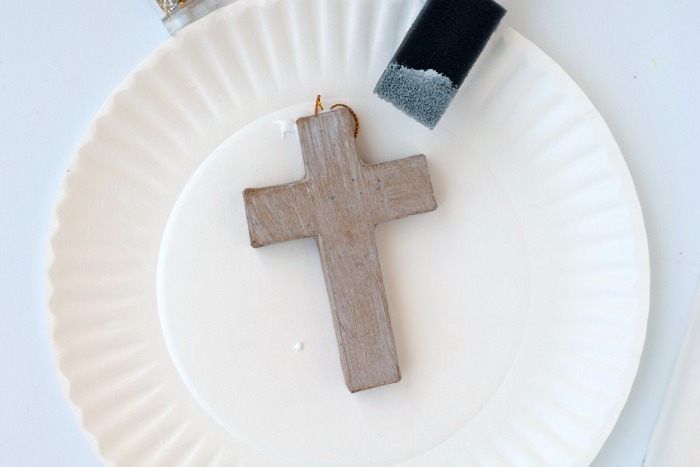 On a paper plate, use the brush to cover the front and sides of the cross with Mod Podge. 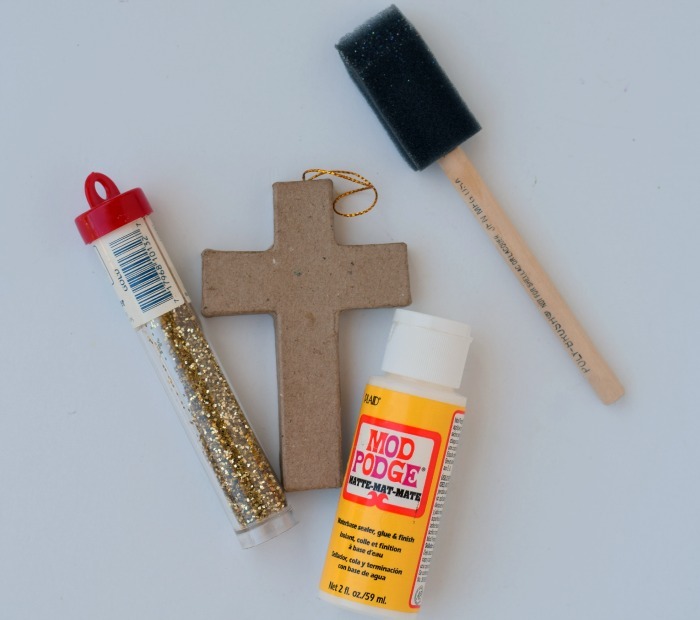 Sprinkle a generous amount of glitter onto the Mod Podge. I always use my fingers to press the glitter down into the Mod Podge. Let it dry for a bit, and then shake off the excess glitter. Repeat if you need more glitter. Let the front dry completely before doing the back. If not, the Mod Podge may stick to the paper plate and then the plate may rip off with the ornament and ruin one side. 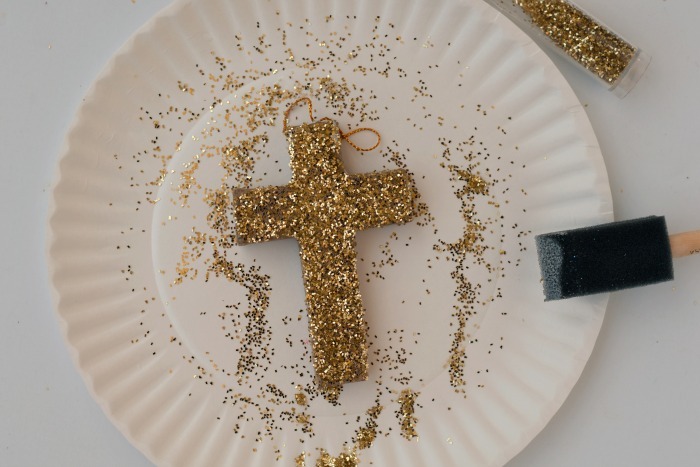 If desired, you may use a sealant to secure the glitter even more.